Consuming beneficial bacteria can improve several aspects of your health, but finding the best probiotic foods takes some effort. Fermented foods—like yogurt, kefir, kombucha , sauerkraut, kimchi, and tempeh and miso—are good sources of probiotics. At any given time, trillions of bacteria live in your body, many of which reside in the large intestine. This colonic community of bacteria, known as the gut microbiota, plays a key role in immune function, digestion, weight management, and blood-sugar control, among other functions. Some of these microorganisms cause disease, while others fight it, and you need a proper balance of bacteria to promote good health. When this balance is thrown off, problems can ensue. That’s when probiotic foods and supplements can be helpful. Probiotics are beneficial bacteria similar to those normally found in your body. The myriad probiotic foods—e.g., drinks, yogurts, and other dairy products—and supplements on the market contain an even wider range of probiotic bacterial strains. But, to reap the benefits, you need to choose the right probiotic product to address your particular problem. An imbalance of the “good” and “bad” bacteria in the gut is believed to contribute to a number of health problems, particularly digestive issues, as well as immune dysfunction and infections—the gut microbiota is a key component of your immune system. The bacterial balance can be disrupted by a number of medical conditions, emotional and physical stress, or even aging. One of the most common causes of gut microbiota disruption is use of antibiotics, which destroy the good bacteria along with the bad, leading to bacterial overgrowth in the intestines. Probiotics help tip the balance back in favor of the good bacteria. In doing so, they may provide some relief if you have gastrointestinal pain, symptoms of irritable bowel syndrome, ulcerative colitis, acute infectious diarrhea, and diarrhea associated with antibiotic use or Clostridium difficile (C.diff) infection. Probiotics also can boost your immunity and reduce inflammation. And some evidence suggests that certain probiotics may have beneficial effects on cholesterol. Probiotic foods and supplements are generally recognized as safe, but they’re typically not recommended if you have a compromised immune system. Ask your physician if probiotics are right for you. Many strains of probiotic bacteria exist, and it may take some trial and error to find the one that works for you. If you notice no benefits from one product after a few weeks, try a different one with a different type/strain of bacteria. Be aware that probiotics may cause bloating and gas, as well as changes in your stool patterns—all indications that the product is probably working. Prebiotic foods provide probiotic bacteria the nourishment they need to flourish. Include beans, asparagus, onions, green bananas and other soluble, fermentable fiber sources in your diet. To be a true probiotic, a product must contain live and active bacterial cultures, and it should indicate as much on its packaging. A general recommendation is to choose probiotic products with at least 1 billion colony forming units and containing the genus Lactobacillus, Bifidobacterium, or Saccharomyces boulardii, some of the most researched probiotics. But, you may have to delve deeper, as each genus of bacteria encompasses numerous strains that produce different results. For example, yogurt is made using two starter bacterial cultures—Streptococcus thermophilus and Lactobacillus bulgaricus—but these bacteria are often destroyed by your stomach acid and provide little beneficial effect. Some companies, though, add extra bacteria back into the product that may produce a therapeutic benefit, so check the labeling and choose products with bacteria added to the starter cultures. Look for a product that has been tested against whatever medical problem you’re looking to address. For instance, if you’re experiencing negative effects of taking antibiotics, you wouldn’t select probiotic foods marketed to help with irritable bowel syndrome. Rather, you’d want a product that helps with your immune system or inflammation. Some people prefer probiotic supplements over foods, but probiotic foods may be a better choice. 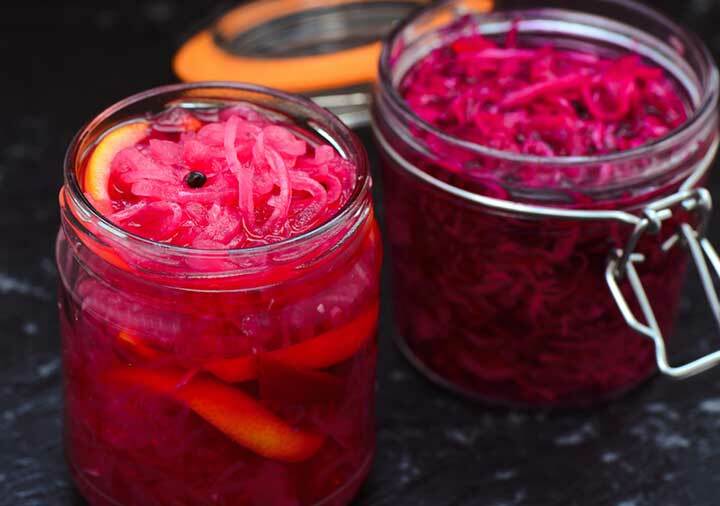 In particular, fermented foods—like yogurt, kefir (a yogurt-like beverage), kombucha (fermented black tea), sauerkraut (refrigerated, not shelf-stable acid produced), kimchi (made from fermented cabbage), and tempeh and miso (made from fermented soybeans)—provide a nourishing environment in which healthful bacteria thrive and release important byproducts: organic acids or short-chain fatty acids. So, go for probiotic foods first, and then if you require a certain strain of bacteria that’s not available in a food product, try a supplement. The probiotic industry is booming, but the quality of probiotic foods and the quantity of viable bacteria they contain can vary. And, not everyone necessarily needs a probiotic, especially if you consume prebiotics like soluble, fermentable fiber that support your own beneficial bacteria. 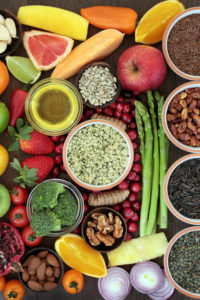 Good dietary sources of prebiotics include dried beans and other legumes, garlic, asparagus, onions, leeks, certain artichokes, green bananas, wheat, and cooled, boiled potatoes. Prebiotic supplements are available, as well. So, if you want a one-size-fits-all strategy to help your gut health, consume a healthful diet that includes prebiotics in addition to probiotic foods. add, aging, antibiotics, bacteria, beneficial bacteria, black tea, bloating, blood sugar, blood sugar control, bowel syndrome, c diff, cholesterol, clostridium difficile, dairy, diarrhea, diet, digestion, digestive, Digestive Issues, fermented cabbage, fermented foods, fiber, food, garlic, gastrointestinal, good health, gut health, health, health problems, immune system, immunity, infection, inflammation, irritable bowel, irritable bowel syndrome, medical conditions, organic, pain, physical stress, potatoes, probiotic foods, probiotic supplements, probiotics, reduce inflammation, sauerkraut, short chain fatty acids, stomach acid, stress, sugar, supplement, supplements, symptoms of irritable bowel, symptoms of irritable bowel syndrome, ulcerative colitis, weight management, yogurt. I was going crazy looking for the best probiotic for bloating until i finally found Florajen Probiotics for women, specifically for antibiotic side effects. It changed my life. This refrigerated probiotic for women is by far the best high potency probiotic i’ve ever tried. I actually was looking more so for a female probiotic for vaginal health – I often times use to get BV and yeast infections which say a lot about the balance of good and bad bacteria. I am going to go ahead and give Florajen a try since someone mentioned it here in the comments, plus I like that the mentioned that its refrigerated. I am now recently learning about the benefits of probiotics and the important role your gut plays in the regulation of your entire body.